Will valuations get in the way of a long bull run? For long-term investors, pondering the question "Will the market go up?" is a guilty pleasure, like gorging on In-N-Out double-doubles. And yet we still do it. OK, maybe you don't, but I do (both, actually). A key component to this question is whether stocks are overvalued, undervalued, or reasonably valued. If the answer is "undervalued," we can feel pretty good about being buyers, while if they're reasonably valued selective stock-picking can usually uncover some bargains. But if stocks are overvalued, that's a problem. Finding worthwhile investments becomes more difficult and there's a greater chance that the entire market will sink. So what's the story right now? This time it's ... different? Investing life would be a lot easier if it were a snap to figure out whether the market is over- or undervalued. But alas, it's not. In support of the "undervalued" thesis, we can look at the fact that high-quality franchises like Chevron (NYSE: CVX) and JPMorgan Chase (NYSE: JPM) are trading at less than 10 times forward earnings. To be sure, there are questions over how long the price of oil will stay up and just how healthy the financial sector really is, but those are still eye-catchingly low valuations. At the same time, the price-to-earnings ratio on the S&P 500 is 16.7, which is below the average of 22.5 during the period between 1988 and today. 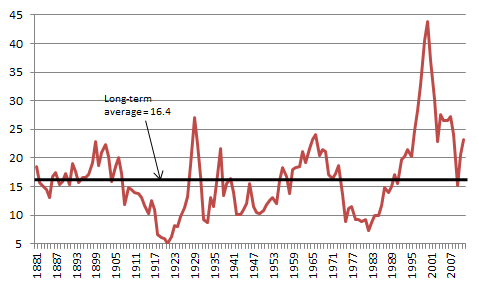 But what keeps bugging me is the fact that the CAPE -- that is, the cyclically adjusted price-to-earnings ratio, which is a valuation measure that uses average earnings over a 10-year period -- is well above its historical average. The bull in me would like to respond to that by saying that valuations in the late 1800s -- which is where the data begins -- aren't useful in 2011. But I think a simple picture tells us all we really need to know. 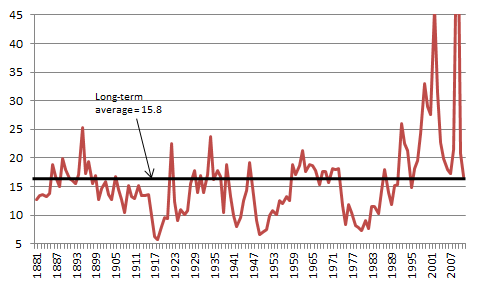 This chart tells a pretty clear story: Stock valuations as measured by the CAPE have, over time, revolved pretty consistently around the long-term average. That strongly suggests that the massive deviation that took place in the 1990s and the first decade of this millennium is still adjusting and will likely lead to a period of lower valuations. To suggest otherwise would be to utter the classic "It's different this time" -- a phrase that never fails to make me uneasy. And for those that are unsure about this "CAPE" gibberish, the picture looks very similar if we switch to single-year price-to-earnings ratios. Source: Irrationalexuberance.com, Standard & Poor's, author's calculations. And the moral of this story? Investors should be particularly conscious of valuations and wary of getting too complacent. Putting an exact timeline on when valuations will adjust downward is a difficult (if not impossible) proposition, but I am not fond of betting against mean reversions like this.